Student's name This field is mandatory. Date of birth This field is mandatory. Address This field is mandatory. Telephone number This field is mandatory. Name of high school This field is mandatory. School sponsored sport This field is mandatory. Accomplishments, extracurricular or community service in 250 words or less This field is mandatory. Coach's name This field is mandatory. Coach's contact information This field is mandatory. If nominee is under 18: Parent or legal guardian's name This field is mandatory. Nominee’s parent or legal guardian's address This field is mandatory. Nominee’s parent or legal guardian's telephone number This field is mandatory. It's one of the things sports teams strive for, but, very few achieve, a perfect record. Not much could be done, when it comes to Kaplan softball, without the efforts of senior 2nd baseman Meryl Guidry. Senior Peyton LeJeune is one of the reasons why the Rebels have won 3 straight baseball state championships. 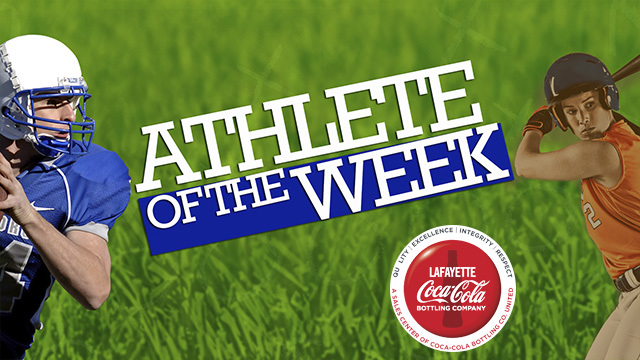 The Breaux Bridge Tigers won the 4A State Championship, and Seth Alexander played well enough to earn our athlete of the week. Senior Guard Pierre Dupre plays well for the LCA Knights, so well this team overcame a 16 point deficit in the State Semi-finals vs. Opelousas Catholic.